Drivers are required to yield at certain times in order to keep pedestrians and other drivers safe on the roads and to prevent accidents. When yield signs are posted, it is usually very clear who has the right of way, who must stop and yield, and who may proceed next. However, there are situations in which a sign may not be posted. In such cases, knowing the rules of the road can help keep oneself and other drivers safe, as well as avoid the risk of a traffic ticket. What Are the Fines and Penalties for Failing to Yield? The penalties and fines vary depending on which violation a driver is being charged with. Fines: The cost of most failure to yield tickets run from $0 to $150 for a first offense. Failing to yield for an emergency vehicle (VTL 1144 and VTL 1144-b) costs between $0 and $275 for a first offense. A second or third offense in 18 months can cost far more (see chart below). Surcharge: New York State imposes a mandatory surcharge of $88 or $93 on each traffic ticket. This is in addition to the fine. Auto insurance increase: In addition to other penalties, drivers who are convicted of failing to yield can see their auto insurance rates go up. On average, drivers see a 9% increase in premiums as a result of a failure to yield ticket. Generally, When Should Drivers Yield? When approaching a junction or corner with a yield sign. When pedestrians are in a crosswalk. When pedestrians are on the sidewalk and the driver is exiting a driveway or private road. At an intersection without a traffic signal, drivers should yield to any vehicle approaching from the right. At an intersection with 4 stop signs. The vehicle that comes to a complete stop at the intersection has first right of way. When two vehicles stop at the intersection at the same time, the vehicle on the left should yield to the vehicle on the right. IMPORTANT: New York requires that you stop completely for a school bus that has pulled over with its red signal lights flashing. Failure to yield tickets are often issued by law enforcement who have been called to the scene of a car accident. Cast doubt as to whether the driver genuinely violated the terms of the statute. This is difficult because it requires a hard set of facts that will most often contradict the officer’s and/or other driver’s account. If the ticket resulted from an auto accident, it may be possible to argue that there isn’t a legitimate witness since often the officer came to the scene after the fact and the other driver involved may not have been paying enough attention to testify as to fault. If and when applicable, negotiate with the prosecutor to reduce the ticket to a lower-point/no-point ticket. No matter what defense a driver chooses, it is best to move forward under the guidance of a skilled traffic ticket attorney. Failure to yield tickets carry heavy fines and will amount to points on one’s license. In extreme cases, judges are authorized to impose jail sentences based on the violation. An attorney can help assess the situation and determine which defense will work best for the case. 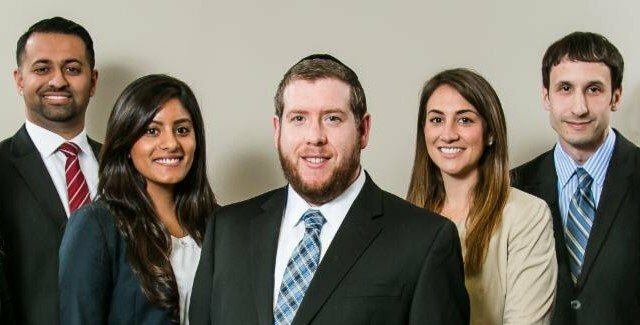 An experienced attorney will be able to gather facts and present the case in a manner that is most likely to yield the desired result. Do I have to come to a complete stop at yield sign? NYS VTL 1172 defines when a vehicle must stop at a stop sign or yield sign. According to the statute, a driver must come to a complete stop at a yield sign only if circumstances require it. In other words, if no other vehicles are present or near, then a complete stop is not necessary. However, if other vehicles are in or near the path and they do not have a yield or stop sign, then a driver must stop at the yield sign and wait for the road to be clear. 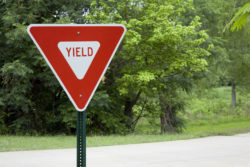 Regardless of whether a person must stop, the law requires all drivers to decelerate when approaching a yield sign. Where must a person stop at a yield sign? When approaching a yield sign, the driver must stop at a clearly marked white line nearest the sign. If no line is present, then the driver should stop before entering the crosswalk. If there is neither a line nor a crosswalk, the driver should stop at the point nearest the intersection where the driver has a clear view of approaching traffic. What does it mean to yield right of way? Yielding means letting others go first. When approaching a junction with a yield sign, a driver must let those who are crossing into his/her path go first. Emergency vehicles with flashing lights on and/or sirens generally have right of way regardless of signs or traffic lights. How do I know when I have the right of way? Do pedestrians always have right of way? No. Pedestrians must yield to cars at intersections controlled by pedestrian traffic signals until the “walk” lights are on. Cars also have right of way at any other part of the road other than the intersection. Do I have to pull over for an emergency vehicle if I don’t know where it is? Yes. All drivers should move over to make room emergency vehicles, even if the location and direction of travel are not immediately clear. Do I have to pull over for an emergency vehicle if it is coming toward me from the opposite direction? Yes, and this is true even if the emergency vehicle is in the wrong lane or going the wrong way on a one-way street. Emergency personnel generally make these maneuvers for a good reason, so other drivers should be sure to do everything possible to make room.